"Noni" redirects here. For other uses, see Noni (disambiguation). The strong-smelling fruit has been eaten as a famine food or staple food among some cultures, and has been used in traditional medicine. In the consumer market, it has been introduced as a supplement in various formats, such as capsules, skin products, and juices. Morinda citrifolia grows in shady forests, as well as on open rocky or sandy shores. It reaches maturity in about 18 months, then yields between 4 and 8 kg (8.8 and 17.6 lb) of fruit every month throughout the year. It is tolerant of saline soils, drought conditions, and secondary soils. It is therefore found in a wide variety of habitats: volcanic terrains, lava-strewn coasts, and clearings or limestone outcrops, as well as in coralline atolls. It can grow up to 9 m (30 ft) tall, and has large, simple, dark green, shiny and deeply veined leaves. The plant bears flowers and fruits all year round. The fruit is a multiple fruit that has a pungent odour when ripening, and is hence also known as cheese fruit or even vomit fruit. It is oval in shape and reaches 10–18 centimetres (3.9–7.1 in) size. At first green, the fruit turns yellow then almost white as it ripens. It contains many seeds. 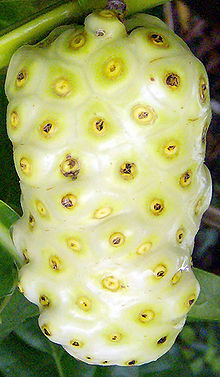 Morinda citrifolia is especially attractive to weaver ants, which make nests from the leaves of the tree. These ants protect the plant from some plant-parasitic insects. The smell of the fruit also attracts fruit bats, which aid in dispersing the seeds. A type of fruit fly, Drosophila sechellia, feeds exclusively on these fruits. A variety of beverages (juice drinks), powders (from dried ripe or unripe fruits), cosmetic products (lotions, soaps), oil (from seeds), leaf powders (for encapsulation or pills) have been introduced into the consumer market. Noni is sometimes called a "starvation fruit", implying it was used by indigenous peoples as emergency food during times of famine. Despite its strong smell and bitter taste, the fruit was nevertheless eaten as a famine food, and, in some Pacific Islands, even as a staple food, either raw or cooked. Southeast Asians and Australian Aborigines consume the fruit raw with salt or cook it with curry. The seeds are edible when roasted. In Thai cuisine, the leaves (known as bai-yo) are used as a green vegetable and are the main ingredient of kaeng bai-yo, cooked with coconut milk. The fruit (luk-yo) is added as a salad ingredient to some versions of somtam. Green fruit, leaves, and root or rhizomes might have been used in Polynesian cultures as a general tonic, in addition to its traditional place in Polynesian culture as a famine food. Although Morinda is considered to have biological properties in traditional medicine, there is no confirmed evidence of clinical efficacy for any intended use. In 2018, a Hawaiian manufacturer of noni food and skincare products was issued an FDA warning letter for marketing unapproved drugs and making false health claims in violation of the US Food, Drug and Cosmetic Act. Among Austronesian peoples, noni was traditionally used primarily for the production of dyes. It was carried into the Pacific Islands as canoe plants by Austronesian voyagers. Morinda bark produces a brownish-purplish dye that may be used for making batik. In Hawaii, yellowish dye is extracted from its roots to dye cloth. Morinda citrifolia fruit powder contains carbohydrates and dietary fibre in moderate amounts. These macronutrients evidently reside in the fruit pulp, as M. citrifolia juice has sparse nutrient content. The main micronutrients of M. citrifolia pulp powder include vitamin C, niacin (vitamin B3), iron and potassium. Vitamin A, calcium and sodium are present in moderate amounts. When M. citrifolia juice alone is analyzed and compared to pulp powder, only vitamin C is retained in an amount (34 mg per 100 gram juice) that is 64% of the content of a raw navel orange (53 mg per 100 g or 89% of the Daily Value). Sodium levels in M. citrifolia juice (about 3% of Dietary Reference Intake, DRI) are high compared to an orange, and potassium content is moderate. Morinda citrifolia fruit contains a number of phytochemicals, including lignans, oligo- and polysaccharides, flavonoids, iridoids, fatty acids, scopoletin, catechin, beta-sitosterol, damnacanthal, and alkaloids. Although these substances have been studied for bioactivity, current research is insufficient to conclude anything about their effects on human health. These phytochemicals are not unique to M. citrifolia, as they exist in various plants. ^ a b Nelson, SC (2006-04-01). "Species Profiles for Pacific Island Agroforestry: Morinda citrifolia (noni)". Traditional Tree Initiative. ^ "Some worldwide names for Morinda citrifolia L." The noni website, University of Hawai‘i at Manoa, College of Tropical Agriculture and Human Resources. 2006. Retrieved 12 November 2016. ^ a b c d Nelson, Scot C (March 2001). "Noni cultivation in Hawaii" (PDF). The noni website, University of Hawai‘i at Manoa, College of Tropical Agriculture and Human Resources. Retrieved 12 November 2016. ^ Jones, C.D. (1998). "The Genetic Basis of Drosophila sechellia‍'s Resistance to a Host Plant Toxin". Genetics. 149 (4): 1899–1908. ^ a b c Nelson, Scot C (8 October 2003). "Morinda citrifolia L." (PDF). Permanent Agriculture Resources, University of Hawaii. Retrieved 12 November 2016. ^ Krauss, BH (December 1993). Plants in Hawaiian Culture. Honolulu: University of Hawaii Press. p. 272. ISBN 978-0-8248-1225-6. ^ Morton, Julia F. (1992). "The ocean-going noni, or Indian Mulberry (Morinda citrifolia, Rubiaceae) and some of its "colorful" relatives". Economic Botany. 46 (3): 241–56. doi:10.1007/BF02866623. ^ Potterat O, Hamburger M (2007). "Morinda citrifolia (Noni) fruit--phytochemistry, pharmacology, safety". Planta Medica. 73 (3): 191–9. doi:10.1055/s-2007-967115. PMID 17286240. ^ Darla Bracy, Division Director (18 July 2018). "Warning letter: Hawaiian Organic Noni, LLC". Inspections, Compliance, Enforcement, and Criminal Investigations, US Food and Drug Administration. Retrieved 15 August 2018. ^ Nelson, Scot C. (2006). "Pandanus tectorius (pandanus)". In Elevitch, Craig R. (ed.). Species Profiles for Pacific Island Agroforestry (PDF). Permanent Agriculture Resources (PAR). ^ a b c Nelson, Scot C. (2006) "Nutritional Analysis of Hawaiian Noni (Noni Fruit Powder)" The Noni Website. Retrieved 15-06-2009. ^ a b Nelson, Scot C. (2006) "Nutritional Analysis of Hawaiian Noni (Pure Noni Fruit Juice)" The Noni Website. Retrieved 15-06-2009. ^ a b "Nutrition data for raw oranges, all commercial varieties, per 100 gram amount". Nutritiondata.com. Conde Nast for the USDA National Nutrient Database, Release SR-21. 2014. Retrieved 12 November 2016. ^ Levand, Oscar; Larson, Harold (2009). "Some Chemical Constituents of Morinda citrifolia". Planta Medica. 36 (06): 186–7. doi:10.1055/s-0028-1097264.